Some cakes are just more of a pleasure to make than others. This was one of them. First of all the couple was really sweet and easy to work with, and I loved the design they chose. 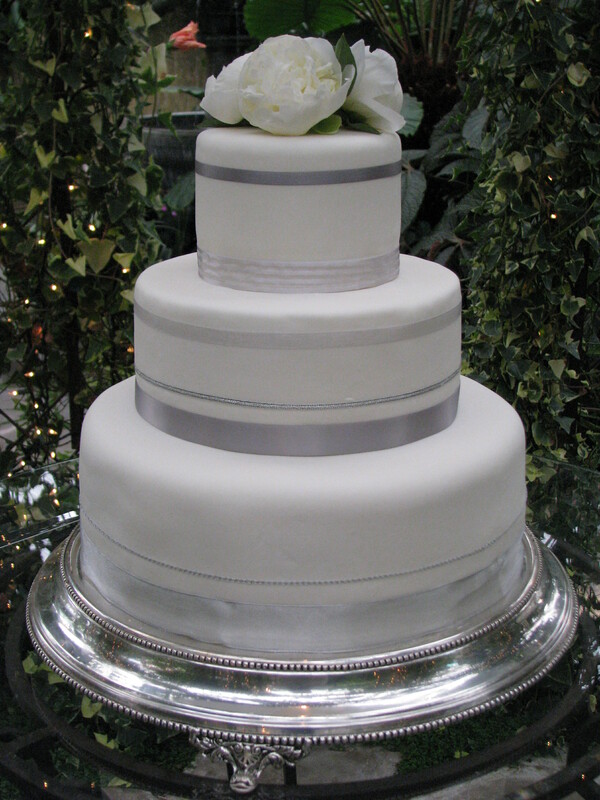 It was from Martha Stewart Wedding Cakes, altered to suit their colors. The cake in the book had a tea cup with olive branches on top, which, ahem, wasn’t her cup o’ tea. So we discussed a couple of options, one of them being the peonies growing in my front yard. I watch the flowers for weeks waiting for them to bloom. They bloomed the very day of the wedding, perfect white peonies. The cake was chocolate with raspberry and chocolate fudge fillings, iced with vanilla butter cream and covered in fondant. Congratulations to Eric and Liz!